Get ready for “big, big fun” (Max Evry, Coming Soon) when the “perfect family film” (Mike Reyes, Cinemablend) MONSTER TRUCKS revs up on Blu-ray Combo Pack April 11, 2017 from Paramount Home Media Distribution. This is the perfect movie for Easter! Whether you purchase the Blu-ray for the Easter Basket or the Digital HD for road-trips during Easter Break, this title is sure to delight! You can currently pre-order Monster Trucks on Blu-ray for $19.99 and free shipping on orders over $35 . Purchase the Digital HD version now for only $14.99! Tripp is a high school senior with a knack for building trucks who makes an incredible discovery - a gas-guzzling creature named Creech. To protect his mischievous new friend, Tripp hides Creech under the hood of his latest creation, turning it into a real-life super-powered Monster Truck. Together, this unlikely duo with a shared taste for speed team up on a wild and unforgettable journey to reunite Creech with his family. A fun-filled adventure that never slows down,MONSTER TRUCKS features a terrific ensemble cast including Lucas Till (X-Men: Apocalypse), Jane Levy (Don’t Breathe), Thomas Lennon (“The Odd Couple”), Danny Glover (Lethal Weapon), Amy Ryan (Central Intelligence) and Rob Lowe (“Parks and Recreation”). A perfect family Easter gift, the MONSTER TRUCKS Blu-ray Combo Pack features over 40 minutes of action-packed behind-the-scenes bonus content. 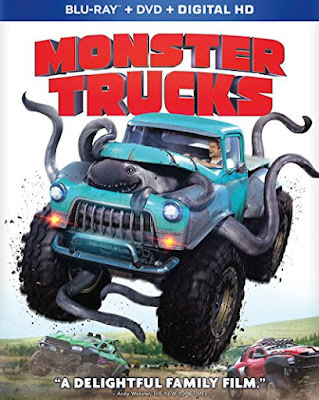 Pair this movie with one of the new Monster Truck movie inspired toys and a chocolate bunny and you have the perfect Easter Basket for the Monster Truck fan in your house! Take a look under the hood and discover the magic behind MONSTER TRUCKSwith interviews from cast and crew, deleted scenes, a hilarious gag reel and much, much more! Plus, the Blu-ray Combo Pack includes collectible MONSTER TRUCKS wall decals, for a limited time while supplies last. The film also boasts a Dolby Atmos® soundtrack* remixed specifically for the home theater environment to place and move audio anywhere in the room, including overhead. This is an amazing family friendly film. Everyone in the family enjoyed this film, even my skeptical husband. It has a fun story line that kids will love. Tripp finds a "creature" and forms a bond with the creature who in turns help power his truck...making it a Monster Truck. Tripp and his friends set out to help Creech find his way home and in the process under-covers environmental risks in drilling for oil. While the story line is cute, there are so many lessons in the film. There are so many funny scenes, great stunts, good family themes and plot. Adults and kids will enjoy this film. It is not a remake, reboot, just a fun original film that will make you laugh!